Enjoy this article? Buy the magazine. A creative herbalist farmer seeks authentic clothing to match her authentic lifestyle. Bromley and Jobey greeted us to their farm one autumn weekend, their demeanor calm and quiet. 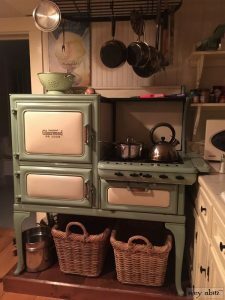 The “Baa Boys,” as they are known by locals, are the resident Southdown sheep of Saturday Farm, a self-catering vacation home rental on Cape Cod. 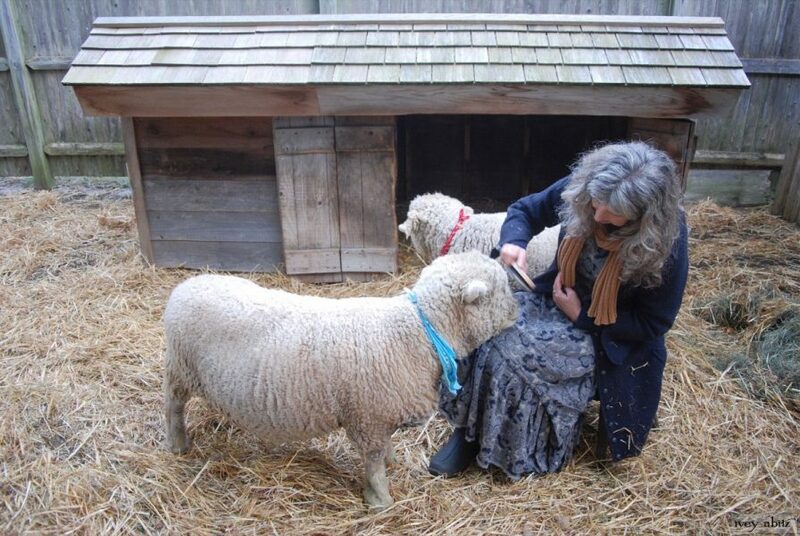 Cindy, owner of Saturday Farm, makes every part of her life as authentic as her Baa Boys. In her search for authentic clothing, she learned about Ivey Abitz garments through a friend’s recommendation. The boys were suspicious of our cameras as we photographed, but they approached us once the cameras disappeared. We liked that about them. They preferred a direct relationship with their humans, authentic and unencumbered by technology. “When I saw the collection for the first time, I realized it was what I had been searching for most of my life,” she explains. Since then, Ivey Abitz has created an entire everyday wardrobe for Cindy, spanning every season of the year. Built in 1820 by a sea captain, and just a short walk from the Atlantic Ocean, Saturday Farm is brimming with stories, many told in its wide planked floors and horsehair plaster walls. The working cooker in the Saturday Farm kitchen is all yours during your stay – and it is a joy to use. Saturday Farm has wifi and a television hidden in a cabinet, but technology is easily outshone by the history of the place. Built in 1820 by a sea captain, and just a short walk from the Atlantic Ocean, Saturday Farm is brimming with stories, many told in its wide planked floors and horsehair plaster walls. Four ensuite bedrooms will accommodate up to eight guests, and it’s just as magical for a solitary couple. It’s a wonderful gathering place for special occasions or a much needed holiday. Birthdays, reunions, and family holidays are all welcome. Saturday Farm is more than a house – it’s an historic character that will enrich your life story. Cindy has expertly balanced function and form to create an inviting, unpretentious setting, ideal for making memories. Its setting and aesthetic beckon the soul to settle in and unwind. And that makes every day a Saturday. For bookings at Saturday Farm, visit www.SaturdayFarm.com. Cindy is an herbalist and works in her studio – an historic barn rebuilt and preserved by her partner, Harry, and her son, Jason. The Saturday Farm garden incorporates plants that have been used to heal ailments for thousands of years. Cindy gives herbal tours of the garden on request. Guests can even purchase oils and sachets, all made by Cindy from the Saturday Farm garden. Cindy digs for Solomon’s Seal at Saturday Farm. She uses it for tinctures. I needed a wardrobe that would be sturdy for me when tending to Jobey and Bromley and the herbs in the Saturday Farm garden. I also needed garments that would be appropriate to greet Saturday Farm guests. I can get up early in the morning, tend to farm chores, take a walk through the woods, then go out to dinner later that day in the same garments. The designs are so versatile that I can wear them doing anything and look completely relevant. They have changed my life. 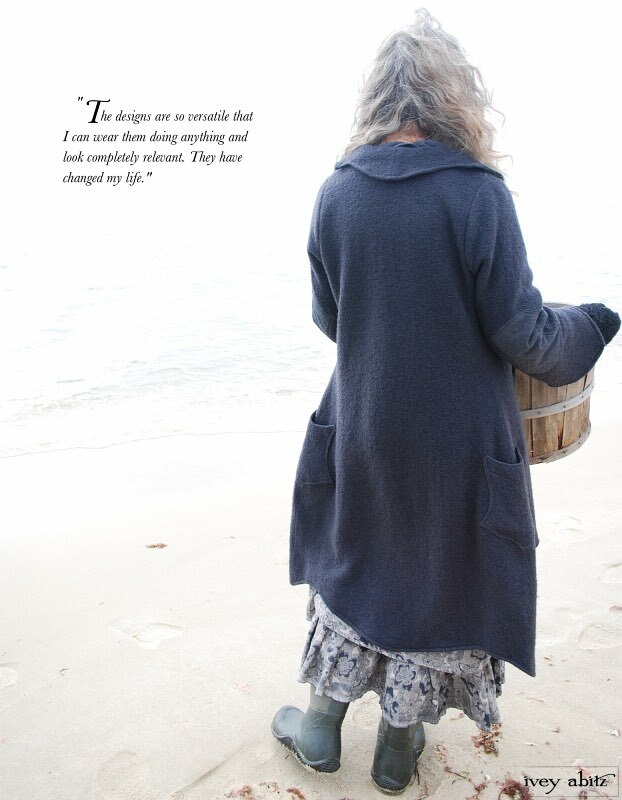 Cindy of Saturday Farm, Cape Cod, wearing her Ivey Abitz bespoke clothing. Cindy is wearing her Limited Edition Blanchefleur Frock with her Chittister Duster Coat. The designs are so versatile that I can wear them doing anything and look completely relevant. They have changed my life. 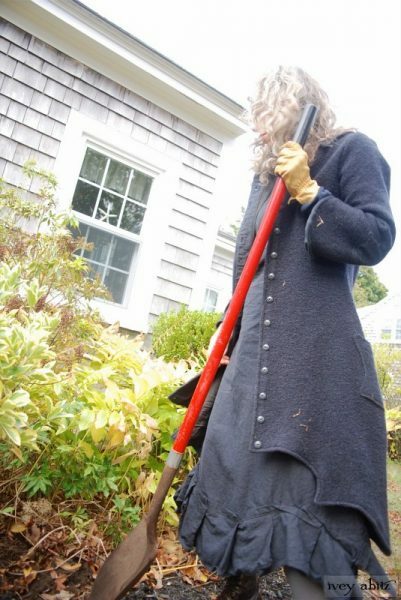 Cindy is wearing her Chittister Duster Coat over her Blanchefleur Frock whilst gathering seaweed for her Saturday Farm garden. Special thanks to Cindy and Harry for hosting us at Saturday Farm and allowing us to photograph their idyllic destination. 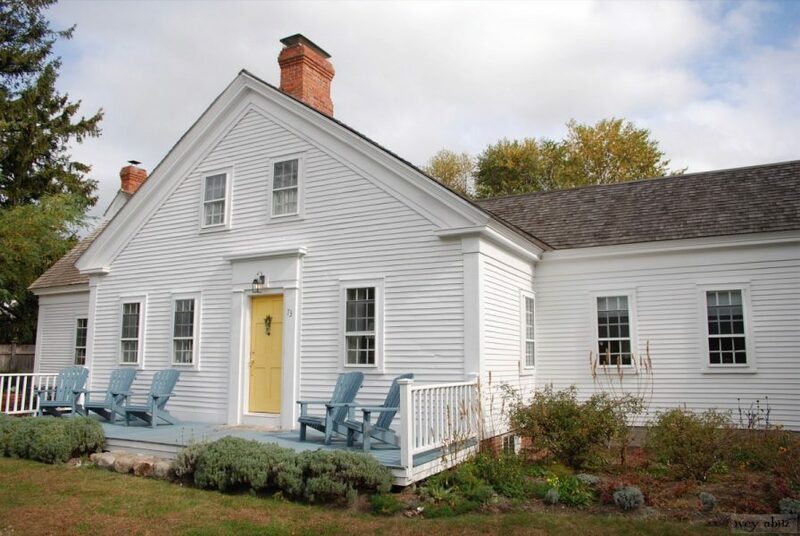 Book your stay at this historic colonial rental retreat at SaturdayFarm.com. Did you enjoy this article? Buy the magazine.